Crossway Le City bus | TEZAS servis a.s. 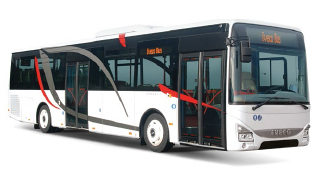 The CROSSWAY LE CITY bus (Low Entry City) is popular with a wide range of customers. In the area of low-floor public transportation, it is one of the best vehicles on the market. The low height of the floor between the front and middle doors provides easy access for passengers. The CROSSWAY LE CITY bus is primarily designed for urban traffic. Choice of 3 lengths and 2 diesel engines. Both engines are EURO VI. 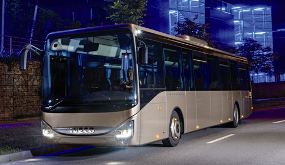 Capacity up to 37 seats. Modern passenger seats of the STER type. Cursor 9 Diesel EURO VI, with capacity of 265 kW. Tector 7 Diesel EURO VI, with capacity of 210 kW. The bus can be equipped with manual or electric ramp a special area for disabled passengers. The standard equipment includes independent heating or the protection of the skeleton and the body against corrosion, with a polyurethane coating. Drivers appreciate the low noise and vibration level, comfortable control, easy access to headlights or the engine fire detection system. The driver’s seat is adjustable, with pneumatic suspension, headrest and a three-point seat belt. The driver’s position also includes an on-board computer, front and side sun screen, a partition behind the driver or a locker.